Interested in learning more about naval operations? Check out the U.S. Navy’s professional reading list. As regular readers of this blog might know, I’ve developed an interest in conflict simulation ever since taking Professor Philip Sabin’s course at King’s College London. (Don’t forget to take a look at the finished version of the Baghdad counterinsurgency game I made for that course.) While I focused on manual, tabletop simulations in Sabin’s course, computer-based simulations have their own set of advantages. Today we’ll look at Global Conflict Blue 2, a free, real-time naval war simulator. GCB2’s main menu. 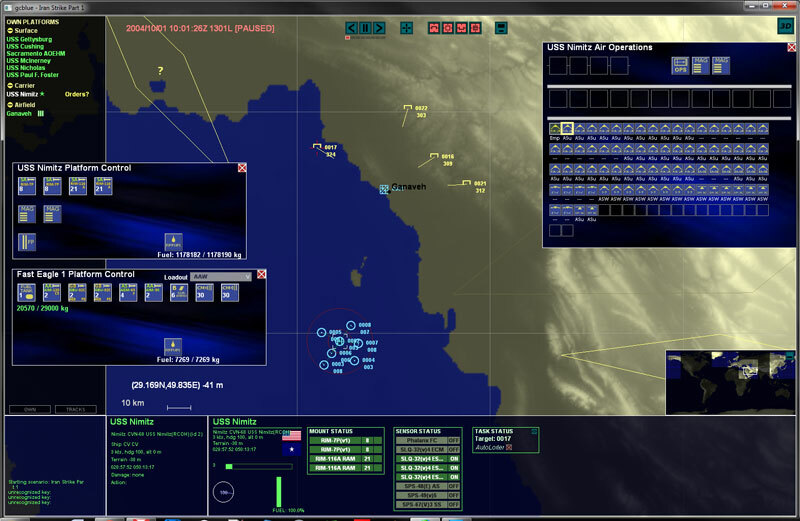 A pre-loaded Iran Strike scenario is selected. Among GCB2’s many features are a global map, a variety of pre-loaded scenarios, an adjustable time scale, and best of all, an extensive editable database. A vast array of sensors and guidance & weapons systems are modeled, giving you a great deal of both control and information as you run a mission. While manual simulations are by necessity easier to learn, they cannot achieve anywhere near the same level of complexity and detail a game like GCB2 can. The control interface is not the most intuitive and has a steep learning curve, but that is to be expected in a simulator with this much detail. Some familiarity with ships and weapons systems is practically mandatory, but the game can certainly be accessible to non-naval war buffs as well. The game’s control interface has a steep learning curve. The real meat of GCB2 comes from its scenario and database editors. One of the primary advantages claimed by manual wargamers is the ability for anyone to easily tweak rules and game mechanics. This is especially important in simulation since it allows a player to experiment and propose more accurate or historically correct mechanics. A decent amount of technical knowledge is required to edit GCB2’s game mechanics beyond the limited choices provided in the options, but the scenario and database editors allow substantial experimentation. Since the entire world map is available, players are limited only by their knowledge and the game’s available units when it comes to creating hypothetical scenarios to play. Try your hand at anything from a strike on Iranian land targets to a skirmish between the US and China in the Taiwan Strait. An active community on the GCBlue.com forums shares their scenarios, ideas, and After-Action Reports, while the developers actively listen to player feedback. 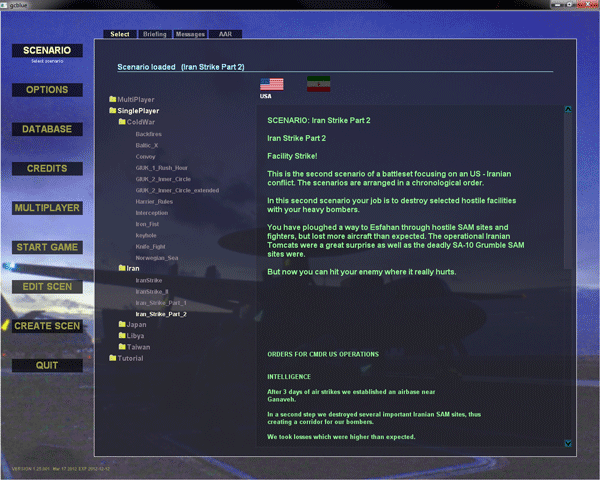 The database the game draws its modeling values from is fully editable in a separate database editor program, allowing players to approach the level of flexibility offered by a manual wargame. In the entry for the Lockheed Martin AAQ-33 Sniper-XR Advanced Targeting Pod, for example, the developers note that the value given for the ATP’s maximum range is a wild guess. A player with knowledge of the Sniper pod can easily change the value for greater accuracy without an ounce of programming knowledge. Values can also be tweaked for experimentation, such as seeing how a weapons system would perform under a different set of specifications. As a free release, GCB2 is well worth the time to download and try out. The game is certainly not without bugs and issues, but the development team has been active in identifying them and listening to player feedback. The latest version is 1.25, which was released on March 11, 2012. Download it and the game manual here. First of all, congratulation for the excelent simulation software that you share with all the world. Second, sir I have this problem when creating and when creating a scene, when I click on save, it show the save in the text box , but when get out of the edition to enter the start game, it is not there, how can I do to save and play my scene created? PD I am runing on xp, but I try the same on other W7 computer but the same case. Just came across your simulation. Cant seem to get t to install on my Win 7 64bit system\, any suggestions? Thanks again.